It’s time again to choose your favorite tunes of Tic Tac Trance! You can now vote for up to 3 of your favorite tracks of the show. The winner(s) will be played in the next episode again! Unlike other shows, the winner(s) can only be part of the vote one time, that means, it will be removed from the vote of the next episode. What are your favorites of Tic Tac Trance #009? 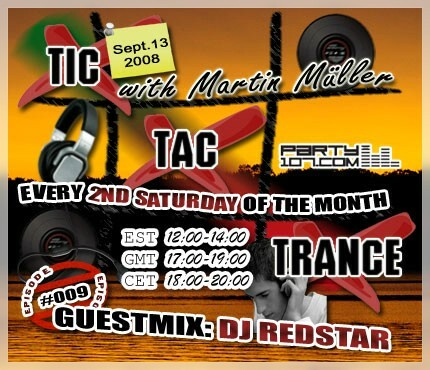 I’m glad to announce that Tic Tac Trance #009 on September 13 will feature a one hour guestmix with DJ Redstar. There will be an super awesome showcase of his newest productions plus some new tunes from his label Red Force Recordings! Furthermore my job for the first hour is to bring you into the right mood with some new tunes from labels like Perfecto, Vandit and maybe some surprises aswell! The show will start at 18 CET / 17 GMT / 12 EST. Check out your local time HERE!